The latest Aston Martin DB11 seems to have something of a leak problem. First photos of the rear end trickled out, and now we get to see the front. Aston Martin DB11: Is This Its Gorgeous Rear End? As Carscoops reports, a tweet from Twitter user @Rudybenjamin13 reveals pretty unquestionably what the next-gen Aston Martin looks like. I like it. 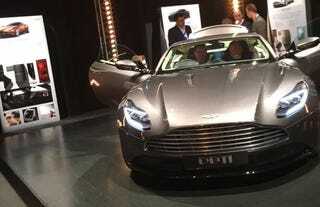 To me it looks a bit like the Aston Martin DB10 seen all-too-briefly in last year’s Bond movie, Spectre—just with headlights and front end designed to meet safety requirements. Not to mention a hood that actually opens, which is important. The DB10 from Spectre, which looks better in motion than on film. And under that hood is an all-new 5.2-liter twin-turbo V12 believed to crank out something like 600 horsepower. Never a bad thing, that. Expect to see this car in real-deal form at the Geneva Motor Show next month.